What to look for when buying a used Nissan Pathfinder? The Nissan pathfinder is a family crossover-SUV that entered the market as a compact sport utility in the mid-1980s and grew to midsize about a decade later. Today, in its fourth-generation, the Pathfinder is a two- or three-row crossover catering to families with a sense of adventure. It retains offroad credibility while being road-friendly and comfortable. The Pathfinder sits between the Nissan Murano and Armada in the company's utility lineup. The first-generation Nissan Pathfinder immediately established the SUV's reputation for offroad readiness and rough-and-tumble living style. A two-door sport utility, the Pathfinder was an SUV variant of the small Nissan Hardbody pickup truck. The Pathfinder was the first small SUV to offer "shift on the fly" four-wheel drive. A base four-cylinder and an optional six-cylinder engine were available as were both manual and automatic transmissions. Both two-wheel drive and four-wheel drive were also offered, with the latter having either a manually-shifted or electronically-engaged (shift-on-the-fly) system. A second-generation of the Nissan Pathfinder entered the market in 1995 and made the move from a body-on-frame SUV to a unibody crossover. 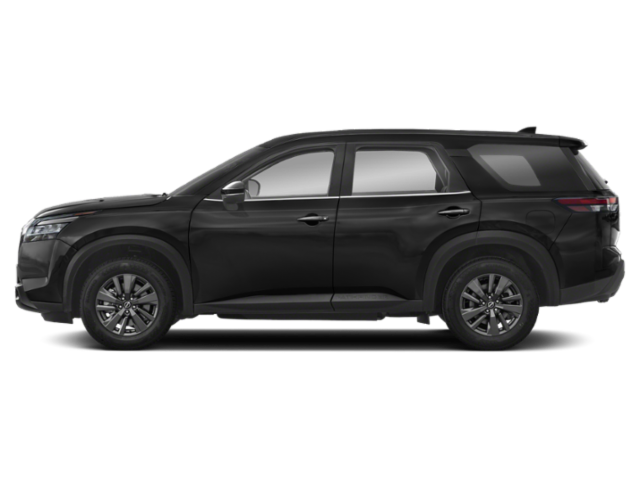 New engines and a more contemporary body design with four doors marked this new generation of the Pathfinder. The Pathfinder grew to midsize, further emphasizing its role as a family toter, with its previous SUV role being filled by the new, smaller Xterra. The four-cylinder engine option was dropped in favor of a new-generation V6 and 4WD now became an option with shift-on-the-fly being standard. The third-generation of the Pathfinder was introduced for the 2005 model year. It kept the family-friendliness and crossover build of the vehicle intact, but one that was completely redesigned to, surprisingly for some, a body-on-frame design. Still based on Nissan's small pickup truck, the Pathfinder now featured a bigger V6. This made way for the extended weight capacity that allowed for an optional third row of seating in the new Nissan Pathfinder. A manual transmission was no longer an option for Pathfinders sold in the U.S. The fourth-generation Nissan Pathfinder was in showrooms for the 2013 model year with a hybrid model coming a year later. The Pathfinder returned to a unibody design and adopted the platform used by the Altima and Maxima sedans as well as the Murano crossover and Quest minivan. Upgrades to the exterior, including door handles now becoming more sedan-like, were introduced and technological upgrades were made to the engine, which was now a smaller-displacement V6 compared to the previous generation. The transmission changed to a continuously variable (CVT) automatic. The most common problems reported for Nissan Pathfinders are in the 2005-2007 model years where coolant leaks into the transmission are relatively common at high mileage (over 100,000 on the odometer). The Pathfinder otherwise enjoys a good reputation for reliability. What Nissan Pathfinder model year and mileage can you get for your budget? For 2017, the Nissan Pathfinder sees some good improvements to its exterior look and its core functionality. A more aggressive exterior marks this new model year, meeting the expectations of those looking for a more SUV-like crossover. On the inside, not much changes in the already-great Pathfinder, but an upgrade to the infotainment is a boon and improved underpinnings are a real upside. An improved engine and transmission translates to more towing and better fuel economy. In a field of very competitive large, 7-passenger crossovers, the 2017 Nissan Pathfinder is definitely one to keep on your shopping list. With prices starting at just $28,850, the 2014 Nissan Pathfinder is a generously sized three row family SUV that truly belongs on your shopping list if you carry lots of passengers and cargo on a regular basis but refuse to drive a minivan. For this model year Nissan is introducing a hybrid version with improved fuel economy of 25 city/28 highway and an overall power output of 250 horsepower from a supercharged 4-cylinder and electric motor combination. We have not had a chance yet to drive the Pathfinder Hybrid so the following road test impressions come from a week with a gasoline V6 powered 2014 Nissan Pathfinder SL.